"I am still waiting for someone to produce pieces of the alleged plane" that caused the Twin Towers to collapse. By Paul Specht on Wednesday, April 25th, 2018 at 5:26 p.m.
Never mind that TV stations aired live footage of a plane striking the World Trade Center on 9/11. Or that there are thousands of witnesses who also saw the planes strike the Twin Towers. Or that Osama Bin Laden took credit for the attack. 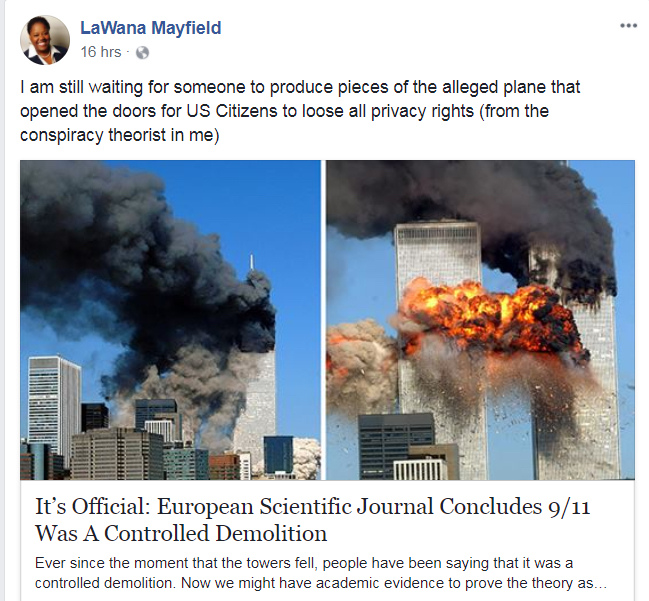 LaWana Mayfield, a Democratic Charlotte city councilwoman, is apparently unconvinced that planes struck the towers and caused them to collapse. In fact, she’s skeptical that pieces of the plane exist at all. On Facebook, Mayfield recently posted a link to an obscure website promoting the idea that the towers in New York City may have fallen on Sept. 11, 2001, for some reason other than being struck by airplanes. "I am still waiting for someone to produce pieces of the alleged plane that opened the doors for US Citizens to loose all privacy rights (from the conspiracy theorist in me)," she posted. Mayfield later apologized for posting comments that caused "hurt and pain," but has declined to acknowledge that planes were responsible for the collapse of the Twin Towers. She appeared on the WCNC show "Flashpoint" to discuss the post. When asked directly about the post – "Do you believe the planes took down those towers?" – Mayfield dodged the question. "What I believe is that we lost Americans during this event. What I believe is that after this event, our nation identified a segment of our community and said this community is now terrorists. And from that moment, we have been saying 'terrorists, terrorists, terrorists,' " Mayfield said. But, she added, "white Americans who have committed mass killings since that time" were not called "terrorists." It’s unclear what, exactly, Mayfield believes happened on 9/11. She didn’t respond to an email seeking comment. When reached by phone Wednesday, Mayfield said the email likely went into a folder she created for 9/11-related emails and that she hadn’t seen it. She then declined to comment on her Facebook post, saying she was walking into a meeting. The "three-day news cycle" has passed, Mayfield said, adding "I’m trying to tackle this housing crisis." It is clear, however, that planes hit the Twin Towers and caused them to collapse. Let’s break this down as simply as possible. There are eyewitnesses who saw the planes hit the towers. News cameras also captured footage of the second plane hitting the south tower. Large pieces of the airplanes were found around Ground Zero, as documented by the U.S. Department of Homeland Security in 2002. A piece – part of a plane wing – was found nearby in 2013. CNN uploaded video of the wing removal. A fragment of one of the planes is on display at the 9/11 Memorial and Museum in New York. Researchers at Popular Mechanics Magazine published a book debunking theories that the planes weren’t actually planes, but missiles or something else. Conspiracy theorists have argued that jet fuel can’t melt steel beams, so the Twin Towers couldn’t have fallen over due to the impact of a plane alone. But the fuel doesn’t need to melt the beams in order to damage their structural integrity. Furthermore, the World Trade Center was built with a load-bearing core in its center (as opposed to concrete columns). But that center, the Washington Post pointed out, was surrounded by a "thin exterior shell — a density of eight to nine pounds per cubic foot. That’s lighter than balsa wood." Mayfield paired her comments about 9/11 with a link to an obscure website, AwarenessAct.com. The site boasts about a feature in the July-August 2016 issue of Europhysics News magazine examining the likelihood that the Twin Towers collapsed as a result of a controlled demolition. According to fact-checking website Snopes.com, the article was written by "a group of scientists who have long been involved with the promotion of 9/11 conspiracy theories." EDP Sciences, which produces Europhysics News, later released a statement on Twitter that downplayed the scientific legitimacy of the article. "EDP Sciences follows the most rigorous peer review standards for its journals of which [Europhysics News] is not one," the statement reads. "As a magazine, the editorial policy of EPN is to publish news and views, which are sometimes controversial. EDP Sciences recognizes that the article discusses some speculative and controversial issues," the statement continues. "However EPN and EDP Sciences believe that the best (and the most scientific) way to settle such issues is to publish them and have an open discussion with all due arguments in which the truth will finally emerge." Mayfield described the planes that hit the World Trade Center on 9/11 as "alleged" planes and said pieces of the planes had yet to be revealed to the public. Eyewitness accounts, video, plane debris and most credible science points to the fact that airplanes struck the Twin Towers on Sept. 11, 2001, causing them to collapse. 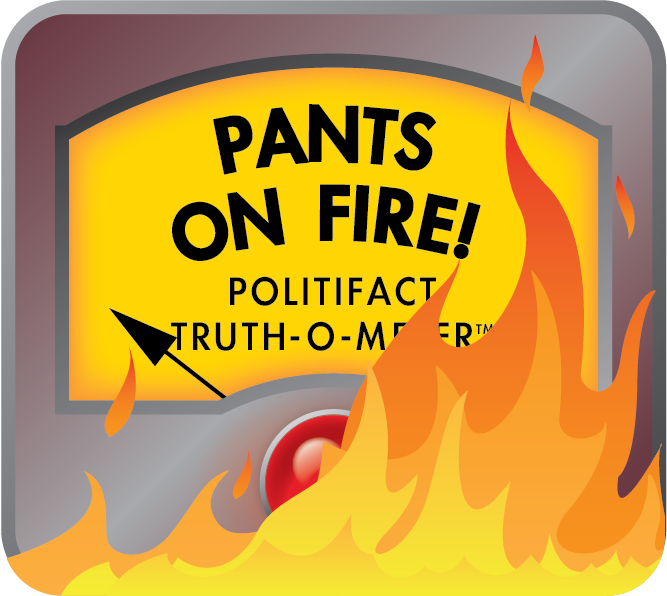 We rate Mayfield’s claim Pants on Fire. "I am still waiting for someone to produce pieces of the alleged plane” that caused the Twin Towers to collapse. Published: Wednesday, April 25th, 2018 at 5:26 p.m.
Telephone interview with LaWana Mayfield, member of the Charlotte City Council. Stories by The Charlotte Observer, "Charlotte City Council member questions 9-11, asking about 'alleged plane' on Facebook," published April 17, 2018; "Charlotte politician sees 'racial overtones' in criticism of her 9-11 conspiracy theory," published April 19, 2018; "LaWana Mayfield's sorry for 9/11 post but doesn't say if plane took down twin towers," published April 22, 2018. Stories by WBTV, "Charlotte City Council member questions 9-11, asking about 'alleged plane' on Facebook," published April 17, 2018; "Councilwoman LaWana Mayfield apologizes for 'the hurt that may have been caused' from 9-11 conspiracy Facebook post," published April 22, 2018. Post by AwarenessAct.com, "It’s official: European Scientific Journal concludes 9/11 was a controlled demolition," published on Sept. 11, 2017. Article on EurophysicsNews.org, "15 years later: On the physics of high-rise building collapses," published in September 2016. Story by the Canadian Broadcasting Corporation, "Bin Laden claims responsibility for 9/11," published Oct. 29, 2004. The "World Trade Center Building Performance Study," first published Sept. 1, 2002 by the Federal Emergency Management Agency. Story by NBC 4 New York, "9/11 Plane Part Hoisted from Alley Near Ground Zero, No Remains Found," published May 1, 2013. Stories by Popular Mechanics, "Debunking the 9/11 Myths: Special Report - The Planes" and "Debunking the 9/11 Myths: Special Report - The World Trade Center," published Aug. 1, 2017. Story by the Washington Post, "Those persistent myths about the Sept. 11 attacks," published Sept. 11, 2011. Fact check on Snopes.com, "European Scientific Journal Concludes 9/11 Was a Controlled Demolition," published Oct. 9, 2016.